In Adam’s Big Pot, Chef Adam Liaw strives for the book’s subtitle: Easy Meals for Your Family. This salad is truly easy but employs a scrumptious combination I bet you’ve never had: coconut, prawns, grapefruit, cucumbers, peanuts, and shallots. On your plate, you encounter a barrage of colors and textures. In your mouth, well, it gets even better. This is an excellent weeknight meal. Quickly prepared, satisfying to your palette, and a jolly match for a chilled bottle of white. In a dry frypan, toast the coconut over medium heat, tossing frequently until the coconut is light brown. Set aside to cool. Slice the prawns completely in half lengthways. Bring a small pot of water to the boil and poach the prawns for about 2 minutes until they are just cooked through and curled into spirals. Peel the grapefruit and break the flesh into bite-sized segments, discarding as much of the white pith as possible. If making the dressing, mix the ingredients together and stir to dissolve the sugar. 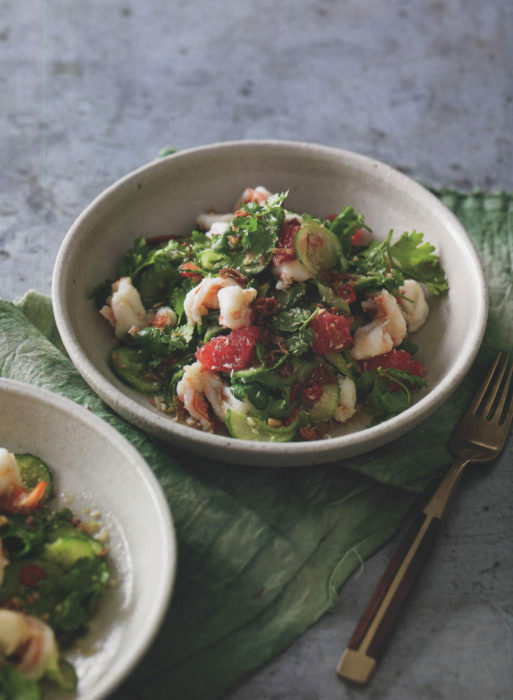 Place the cooked prawns, grapefruit, cucumber, toasted coconut, coriander leaves and peanuts in a bowl with the Nuoc Cham or dressing and toss well. Serve scattered with fried shallots and sliced chilies, if using.